If there is one chutney that I can have everyday with idli and dosa, it has to be the kaara chutney / spicy red chutney. I have shared a different version of the kaara chutney here. This recipe is a 5 minute kaara chutney / spicy red chutney recipe. No frying, no sauteing. Easy, breezy chutney cooked to perfection in just 5 minutes. This is an OPOS – One Pot One Shot recipe. # This recipe works well ONLY in a 2 or 3 liter Indian style pressure cooker. Do not use a big cooker without adjusting the quantity. It wont work. Do not scale the recipe up or down. Use exact measurements and equipment. If using induction stove (recommended), cook the chutney ingredients in 1200W for 5 minutes. If using gas stove, keep on medium and cook for 5 minutes. When 5 minutes is over, switch off the flame and release the pressure immediately. Do not try to force open the cooker with the pressure inside. Its dangerous. Here is how to do the chettinad style spicy kaara chutney. Hope you enjoy the video. Serve the Kaara chutney with idli, dosa, paniyaram or uthappam varieties. Recipe for Chettinad Kaara Chutney. A perfect accompaniment for idli - idly and dosa. Tamil style spicy red chutney recipe. Video recipe. Take a 3 litre pressure cooker and add in the oil to the pan. Add in the onion, tomatoes and garlic. Add in the chillies, tamarind and jaggery. Cover the pressure cooker with a lid and add the weight. Induction stove is preferred. If using induction, set the stove at 1200w. If using gas stove, set it in medium flame. In both methods you should get about three whistles. You can switch off after 3 whistles. 5 minutes or 3 whistles whichever is first. After 5 minutes, switch off the flame and release the pressure manually. Open the cooker and add in the salt. Grind to a paste without adding any water. Serve with idli, dosa, uthappam etc.. The term OPOS and One Pot One Shot are registered trademarks owned by Mr.Ramakrishnan. The recipes have been adapted using his OPOS principle. They are used in Kannamma Cooks with prior permission. I got a lot of mails asking if the bottom will get burnt as we are not adding any water. Trust me. As we are not sauteing anything, the moisture from the veggies are intact. So that will do the trick. Also cook in medium high to high heat for just 5 minutes or 3 whistles whichever is the first. If you are afraid of burning, keep the flame in medium. Trust me in this. I have done it and it works. That’s the beauty of OPOS. Result is so good. I didn’t omit tamarind and jaggery. Thank you. Yes you can but the taste will not be the same. Best yummilicious kaara chutney i have ever made and tasted!! As my hubby loves kaara chutney, surprised with this tempting recipe on his br. Day. Even my maid dint waste a bit and everyone in home loved the taste. Thank you so much for your awesome recipe dear! Thank you so much. Glad your family liked the recipe! Why would I fall in love with every one of your recipes. It tastes like my mom’s. Thanks a lot sis. Thanks so much. Really glad that you liked the recipe. Happy Cooking. Can I make 5 liter cooker ? This is an easy & super quick recipe. And a super hit one! This OPOS chutney is now a staple sidedish in our house hold. A humble suggestion. If you add salt to the cooker itself we can be very sure tat it’s not burnt at the bottom. The water exudes as we add salt. So the beginners cannot have second thoughts to try this amazing time saving yummy recipe. I am learning a lot A LOT from your posts deary. Pl keep going. Thank you. That’s a good suggestion. I will definitely do that. 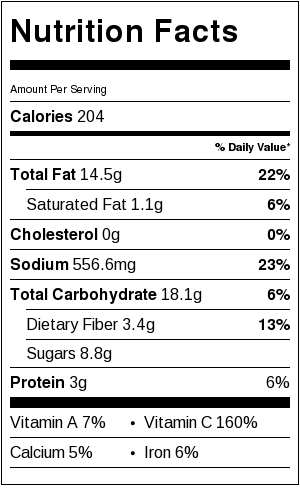 What brand sesame oil to use. I stay in Mumbai. Should we use coconut and sesame oil in all chutney preparations? In Tamilnadu, gingely oil (sesame oil) is preferred in cooking. I use a brand called idhayam. I will try this recipe as a side dish for dosa tomorrow morning. I am about to ask you a silly question – you mentioned 2-3 Ltr pressure cooker but I only have 5 Ltrs. Would there be a difference? Should I cook for a longer time? Good luck & I wish you a bright future. The recipe might burn in bigger cookers without altering qty. 2-3 liter cooker is advisable. Wish i were there to hug u and shake ur hands by saying ” My beloved queen, your recipes are awesome …”. ?..Being a fan of You ,makes me love to cook and it turned out to b really well nowadays…Thanks again my lovable sis..?? Thank you so much for your kind words Viji. Happy you like the recipes. Hugs sister! Wit two kids being abroad, yur site has been a daily check for instant recipes..
Can i know for opos ramakrishnan sirs recipes link pls.. Thanks Nallamai. Check out in you tube. He has a channel. Tried and came out well.. tasted perfect and as if i was an expert in this recipe. It was magical.. thanks much. Could you please let know from where i can purchase the OPOS book by Ramki? Online or any bookstore? Thanks Priya. Please check your mail. Hi, When you meant grind to paste, what equipment is to be used? Hi Kannamma. Your recipies rock. I know you have heard this many times before but seriously this I am saying from the bottom of my heart. Till now I have tried your sambar recipies and some chutney recipies they all turned so tasty that I ended up making chinna vengaya sambar for Onam. All loved it and my husband told me that after 9 years of marriage now I get to taste a typical Tamil style sambar made by you. Before getting to know about your blog my Tamil sambar always turned out to be something else.?. Anyways keep posting and I will keep trying. Love your style of cooking. Your words mean a lot to me. Thank you so much for taking time to write to me. I am really glad that your family liked our sambar. I am really happy that you trusted KC and made the recipe on Onam day. Thanks a lot and Happy Cooking. 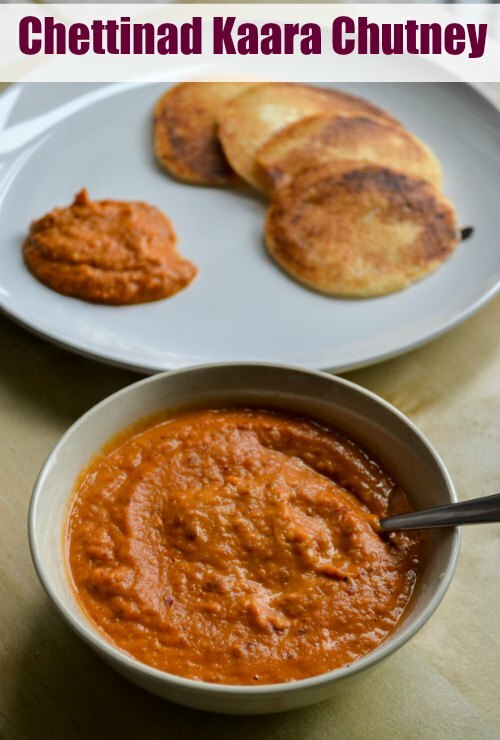 This kara chutney OPOS turned out great and was an instant hit in our household. Here we release the pressure manually in contrast to onion thokku where we wait for the pressure to release. I got a kind of steamed smell in onion thokku but not in kara chutney. Is that the reason behind it? Please clarify. Hi Andal. This is an interesting observation. Just try adding a couple of tablespoon of more oil while doing the thokku. That might be the reason for steamed smell I am guessing. Glad you liked the chutney. Thanks for this recipe. It came out really well. Took me just 10 mins to cook and had with hot idlis. Worth the try after a long day at work. I also like the fact that you are uploading the recipes daily! What is it beside chutney? Is it oothappam? Thank you so much Thahira.